Just Starting with Waldorf Homeschooling? If you and your family are just getting started with Waldorf homeschooling, here are ten first steps. Keep it simple and make one or two changes at a time. Pretty soon you will see what a difference these changes can make! Focus on rhythm rather than on perfectly planned and executed blocks or lessons. Daily rhythm includes meals, chores, lessons, bedtime. Take a deep breath! You don’t want to rush through daily life activities just to get to the lessons. Activities and chores are as much a part of the “lesson” as the lessons. The whole of your day and how it happens is a lesson in itself. Make a simple plan for chores, and include all family members. Do the same for meals. Keep the TV and computer off. If this is new to your family, consider no TV on school days and evenings; maybe introduce family pizza and movie night on the weekend. Go outside every day. Unstructured time in nature is crucial and so nurturing. Create a Nature Table inside. Bring items in from your walks to display on this seasonal table. Read aloud every day. All kinds of stories about nature, animals, the seasons, good people. Stories form the foundation of our lessons. Establish a rest time each day. Children can nap or read on their own beds or at least in their own rooms, depending on their ages. This can be helpful all the way up through age nine or ten! Tell or read a story one day, and then retell it, act it out, or paint it the next. Begin to incorporate The Seven Lively Arts into your lessons and your days – drama, drawing, movement, music, modeling, painting and speech. All in addition to stories, of course! 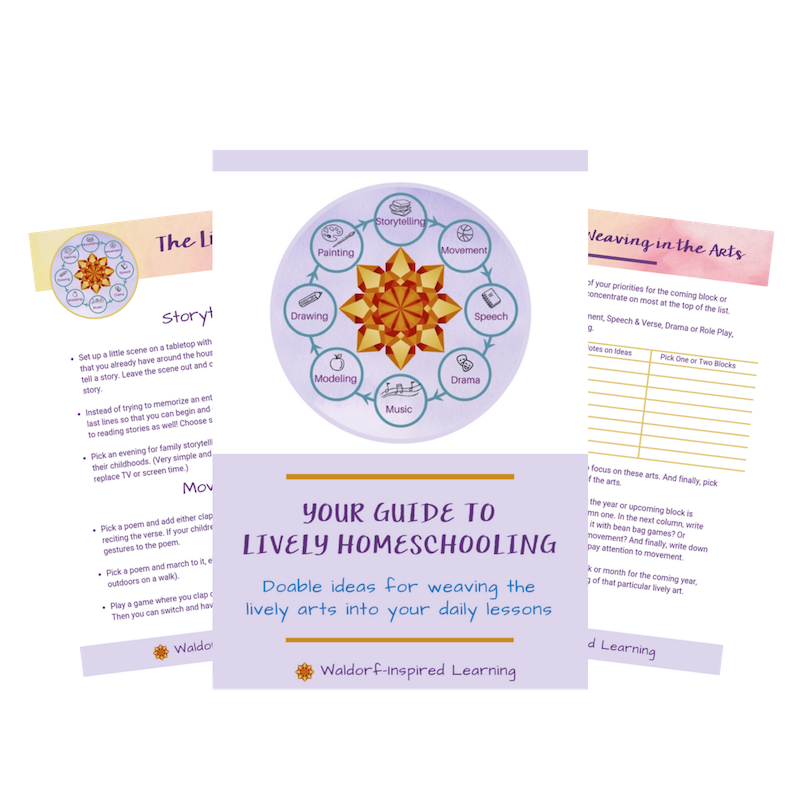 If you want specific, actionable ideas for how to weave the arts into your lessons, click here to get your Checklist for Lively Arts Homeschooling. 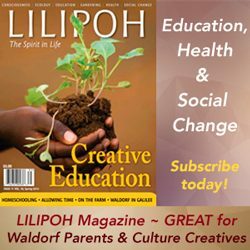 In Waldorf Homeschooling Simplified, I give you a great overview of the Waldorf approach and how to bring it to life in your homeschool. Wondering what the most critical supplies are for getting started? This list contains affiliate links for your convenience. Click here to read my full disclosure policy. If your children are still in kindergarten, focus on simplifying and providing natural playthings. Begin reading about Waldorf education and incorporating lots of songs, and movement games, seasonal activities and stories into your days. If you need help establishing strong rhythm and routines, and want to understand why this is so important for children, read Simplicity Parenting by Kim John Payne. Buy good beeswax crayons. I recommend Stockmar, a mix of stick and block crayons. Buy good quality watercolor paint like Stockmar. Buy a set of good quality colored pencils; Lyra is great. Other supplies such as paper can be found locally at a craft or art supply store. For paper, I suggest the Strathmore 300 series. Drawing paper to create main lesson books, or you can buy main lesson books pre-made, or simply use an artist’s sketch book. Next, make some bean bags, one for each member of the family. You can read a simple description of how to make and use bean bags here: Movement Games for Children. You might also be interested in my video Waldorf 101 for Homeschoolers. 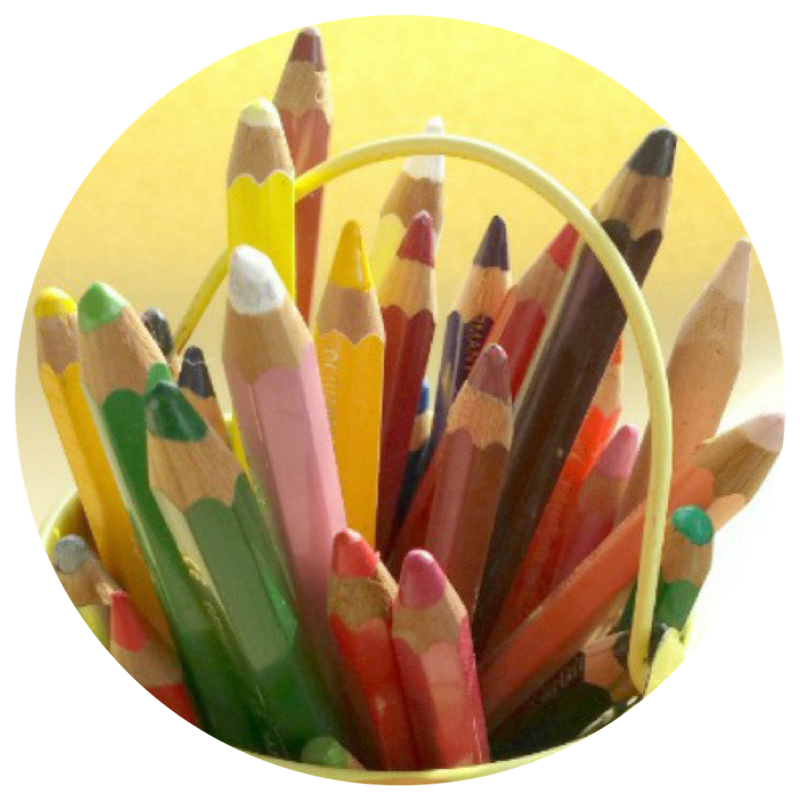 Are you looking for instruction in the Waldorf arts of crayon drawing, watercolor painting, and chalkboard drawing? My recommendation is Waldorf Art for Beginners from Waldorfish. You can read my review here: How to Learn Waldorf Art. Want to learn how to teach your child a beginning instrument at home? I recommend the online courses from Living Music. Jodie has a program called The Magic Flute, volumes 1 and 2, that teach you how to teach your child recorder, penny whistle, or flute. Complete with videos, songsheets, and mp3 recordings. Looking for more support? 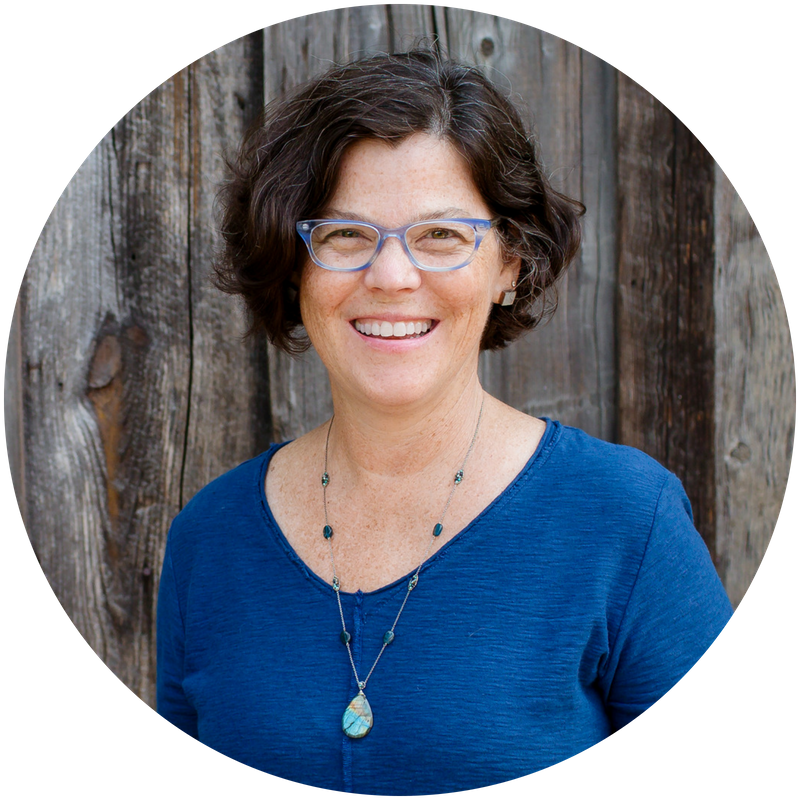 I’ve created a mentorship community, Homeschool with Waldorf, to give you the training, coaching and planning support you need to make Waldorf homeschooling work for your family. 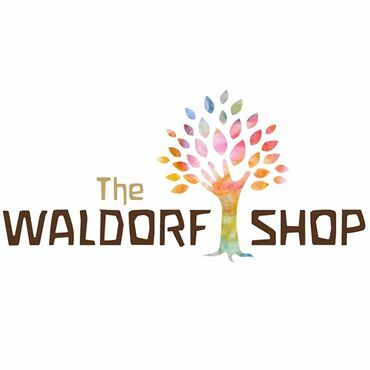 Come join an amazing community of Waldorf homeschoolers who are on the same path as you! 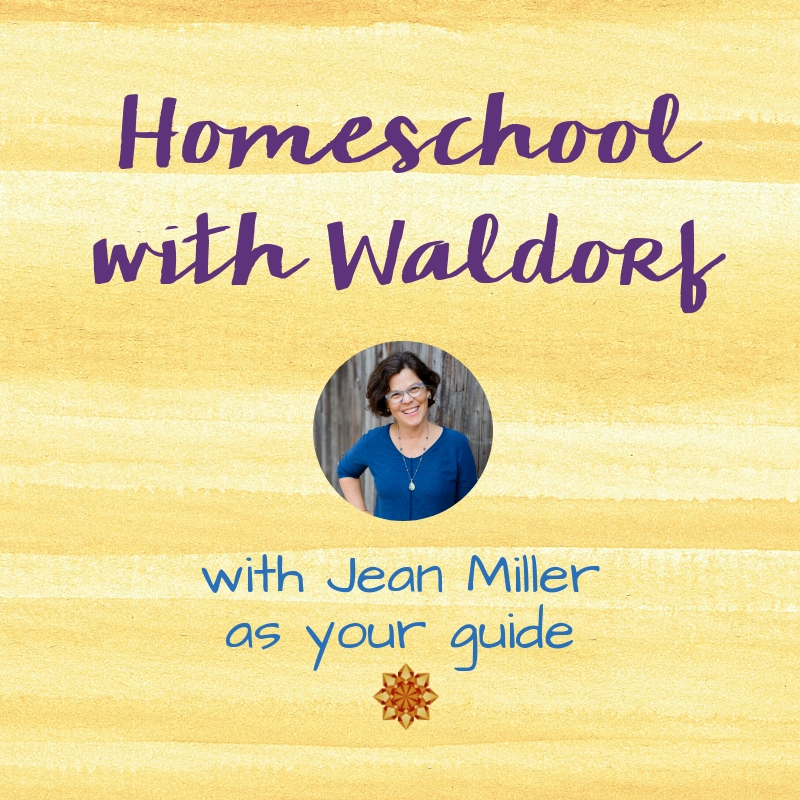 You can homeschool your child with Waldorf. Just remember to keep it simple with these 10 steps and supplies. I feel that is am coming from knowing nothing, but the more I research Waldorf learning I am more serious about homeschooling my children this way. My oldest is 4. I’m going to follow this getting started list, and I’m hoping for the best! Thank you. I will be in contact with you again soon. I may need a mentoring session but I’m going do a little more reading to inform myself better. Thank you. So glad you’re here, Caitlin! Remember, homeschooling is a journey and you will be learning just as much as your children! If you haven’t already, I suggest you look at my Resources page. If you scroll down, there are a few more lists of favorite books you might want to begin exploring. You have lots of time. I look forward to hearing how it’s going for you! I am so thankful when I found your page. I am in Vietnam, an Asia countries and just started to know Waldorf few months ago. I am really into this method and want to homeschool my 2-year-old child with this. Your page really lights the way for me to go. Thank you very much! Welcome to the beautiful Waldorf journey, Clara. So glad you’re here! My apologies upfront for a long winded comment. I have been homeschooling my children, who range in age from 20 to 3, since 2005. My older two have graduated, my 3rd born is in 9th grade at a local private school, and my younger 3 who are ages 11.5, 7 (8 in April) and newly 3, are homeschooled. I have mostly longed for more of a Charlotte Mason method in our home, but ended up switching to traditional methods because I have lacked the self-confidence of what we were doing and always hated the switch as did my children. I felt like and still feel like we are missing something. In all my years of homeschooling I cannot recall learning about the Waldorf method and it intrigues me greatly. I wonder if this is what is missing from our home? My 11 year old has dyslexia, dysgraphia and dyscalcula. How do you incorporate the Waldorf method later? 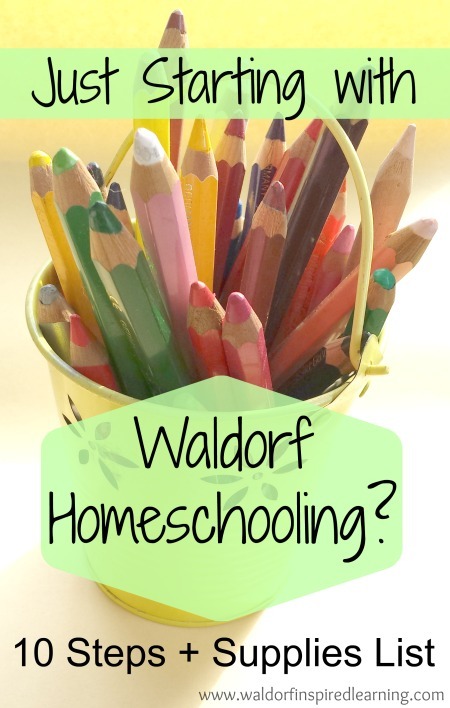 I have sent out several inquiries to local homeschool groups to see if there are any Waldorf families in our area but haven’t gotten any responses, so without seeing it it’s hard for me to visualize how to incorporate it into our life. Does this make sense? I would greatly appreciate any feedback you are willing to give. So exciting that you’ve found Waldorf. And I think it would enliven your homeschooling in a wonderful way. My suggestion would be to explore three concepts: main lesson block learning, rhythm, and how to weave the lively arts into lessons. Here are some specific blog posts or pages on my website that I would recommend you check out: The Lively Arts, Rhythm is Always the Answer, and the Block Rotation for Grades 1-8. That’s a good place to start. And if you want to read more about what Rudolf Steiner said, you can check out the posts at The Steiner Cafe. I also have lots of free webinars recorded on At Home with Waldorf. All the best as you explore this wonderful method! I’m very interested in starting early with homeschooling. Waldorf fits our family’s beliefs and ideas of how children should be taught. I was wondering if you could help with some pointers for coming up with a plan to bring to my state to get my home school started. I live in NY and have read it is one of the more difficult states to homeschool in. Thanks so much! Isn’t it fun to discover Waldorf and feel like it’s such a good fit!?! You don’t mention what “early” means, so I’m not sure the age(s) of your child(ren). The first step though would be to get to know your state’s regulations. I’m not familiar with New York’s requirements in detail (I’m in Ohio). After studying up on what the regulations actually are in your state, you’ll be able to begin to “translate” Waldorf so that you become adept at showing how your homeschooling meets those requirements. 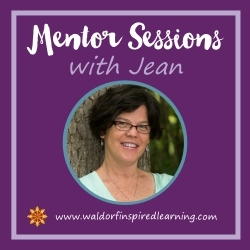 If you want more in depth help designing and implementing your homeschooling, I offer one-on-one Mentor Sessions. Thank you for this well written and clearly explained, Waldorf information. I have always been intrigued by Waldorf and wished I had started home-ed earlier. My 10 year young DS, with ASD, is a visual learner, the basics mentioned above, are exactly what would suit him (and me ?). 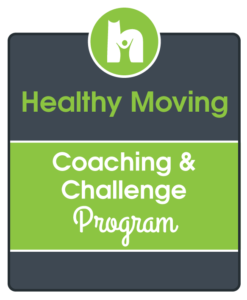 I am enjoying the journey of learning with him, at his pace… I plan to implement some of the 10 steps, once I have gathered resources – (feeling excited already!). Thank you again.